Shred, ride, soar, zip, and fly down the mountain at Attitash Mountain Resort and experience all the best of New Hampshire. Located in the heart of the White Mountains, Attitash Mountain Resort is New Hampshire's premier year-round vacation area. In the winter months, this popular ski/snowboard destination offers 68 trails and 11 lifts across two big, connected mountains (Attitash & Bear Peak) that combine traditional New England runs and challenging terrain for every level. There's a ski school for beginners, and the mountain also offers snowshoeing, cross-country skiing, and many lodges to grab drinks and get cozy at. 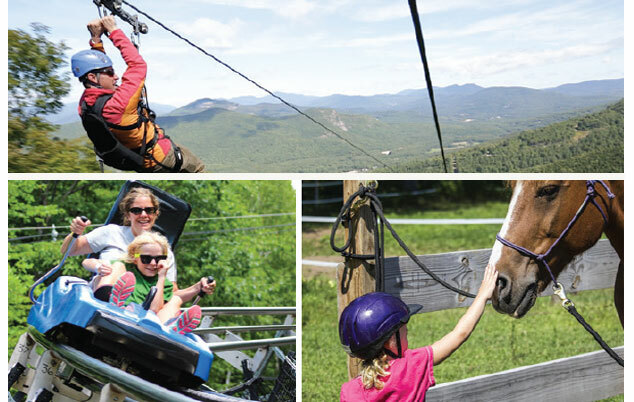 Warmer months at Attitash brings beautiful green or fall-colored landscapes peeping through the mountain tops that are perfect for viewing from the Alpine Slide, Mountain Coaster, and the thrilling Attitash ZipTour, which is the longest single-span zipline East of the Rocky Mountains. This family-friendly destination has something for everyone set in the middle of New Hampshire's White Mountains. Are there restaurants at Attitash Mountain Resort? Attitash has several restaurants and dining establishments while at the resort. From casual grab & go options to full-service dining, get your grub on after a day on the mountain. Meet up with friends for Après ski with live music and pub specials in Ptarmigan’s Pub every Saturday. The Attitash Cafeteria in the Main Base Lodge offers sandwiches, salads, and pizza. What are some things to do during summer at Attitash Mountain? The fun doesn't end when you hang up your ski's for the season. Attitash Mountain Resort stays alive all year long, with plenty to do in the summer. The Nor’Easter Mountain Coaster offers a heart-pounding 2,880-foot journey down through the forest, while the Alpine Slides provide a new way to ride down the mountain. Take the ZIPTOUR across the mountain and embark on a 1 to 2-hour adventure with breathtaking views. For a more relaxing way to spend the day at Attitash, take the chairlift over the mountain tops and take in the scenery. Get down at the Bud Light Mountainside Summer Music Series and enjoy free outdoor entertainment every Saturday from July through Labor Day Weekend.